I have been known to say that the younger you are, the faster you can learn how to juggle. While that may be true for some, I think I was proved wrong today. I held some lessons for some really young kids in the morning (some were probably four or five) and then some lessons for some college students in the afternoon. The college students were by far faster in their learning curve. Some of it may be the fact that these college students were Baptist missionaries doing Backyard Bible Clubs for the whole summer. They wanted to learn a new tool to use in their children’s outreach events. I’m so glad they chose juggling. You see, they were motivated to learn. They had a vision to use it for a purpose. Some of the four year olds on the other hand, they just wanted to toss a ball up and down. I had a tremendous visit with my beautiful wife. She is definitely worth it. We got to go for some walks and share time together over meals in a little coffe shop called Harbor Lights in Leavenworth, Kansas (check it out if you ever go). I got to meet an incredible man named Randall while I was there. He and several other servants of the Lord run a youth center called Kids Connection. It is a safe place for young people to hang out when they’re not in school. There are games, computers, snacks, and loving adult supervision. I was inspired to see this wonderful place in action. I got to juggle for the kids there (in a different location). I’ll be at Lifebridge Church this weekend, I’ll let you know how that goes. 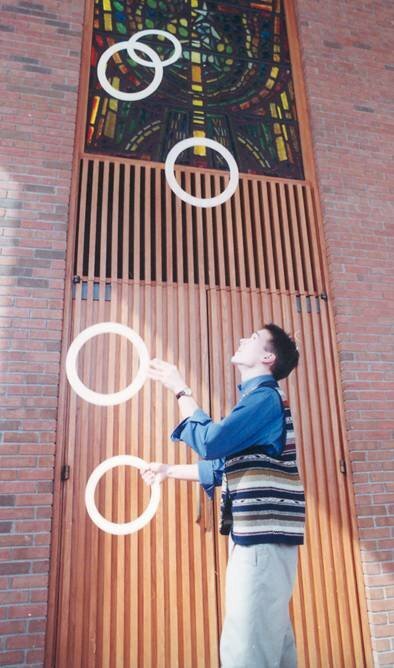 I was chatting with some other jugglers the other day and one of them told me about a college class (in Florida, I believe). This was a Psychology class for college students. Apparently, for the final exam, the professor will grant an “A” for the exam only if the student can hold a juggle of three balls for two minutes. Sound harsh? Many people would think so. Others would see this as an easy “A.” The point the professor is trying to make is that juggling is an activity that many people simply mentally tell themselves they can never do. But the truth is – anybody can juggle. Of course some people are born with inclincations to do better at it than others. But the basic task of juggling three balls is something everyone can achieve given a little practice. The point of the professor, though, is bigger than juggling. He wants to inspire students to avoid putting “mental blocks” between themselves and challenging-looking tasks in this life. So, go learn how to juggle. And learn something that your mind says you cannot do. And do not forget the ultimate power of our accomplishments – Jesus Christ. For with Christ – nothing is impossible. And I can do all things through Christ who strengthens me. Lots of people have been asking me, “Where’s Sarah?” That’s my wife if you do not know. I have to say, “She’s working in Kansas City.” And then I proceed to tell them why she works so far away, the duration of her stay, and if I’m going to see her soon. We at least get to talk on the phone every evening. The reason why she is there is because she works with the Southwestern Company. This is a sales job and she gets out-of-state territory. Why? It’s complicated. You see, the job is designed for young college students. And the job is very demanding of your time and energy. If they let students work their hometown, they would be too distracted to be successful at the job. Sarah could probably handle this job even locally, but she sticks with the format even though she is in her eighth summer and she is older than college-age. Plus, she does well enough at this job to earn tuition for this coming school year faster than any other job we know of. I”ve done this job with her for the past 3 years and it has been amazing. Now, I’m committed to working at our church and juggling for the summer – while she sells a few educational books. If military families can handle a year apart, Sarah and I can handle a few months. Besides, she doesn’t know this, but I’m going to go see her sometime this week for a few days. Then I might even drive out a second time and see her. She’s worth it. I love my wife. I love Sarah. The longer we’re apart, the more pictures of her I’m fishing down in the housing and staring at before I go to bed at night. She is beautiful. She is precious. She is my wife. "Our Joy is Their Sorrow"
One crazy event that has occurred recently is the misidentification of two young women involved in the fatal Taylor University van crash back on April 26th. In that accident, 5 people died, and several more were injured. It turns out that one of the injured (Whitney Cerak) and one of the dead (Laura VanRyn) looked alike, and yes, those at the scene of the accident misidentified these two women. So Whitney has been in a coma for five weeks, being tended by the wrong family (who thought she was their daughter Laura). Meanwhile, the Ceraks and 1400 other people held a funeral for Whitney when it was really Laura VanRyn in the casket and Whitney was actually alive the whole time in a hospital in Fort Wayne, IN. Check out the Taylor Website for all the updates and a link to the blog that is following this confusing tale (www.taylor.edu). On another note, It looks like I’ll be a street performer for the Kentucky Renaissance Faire this weekend. It’s in Eminence, KY and it will be my first time at one of these things – it should be fun. Apparently many people get REALLY into these faires. My friends Justin and Erica (soon to be Ball) are getting married tomorrow night in Bardstown, which is not too far from Eminence. I’ll let you know how it goes. Posted on June 2, 2006 Categories Children's Ministry1 Comment on "Our Joy is Their Sorrow"
I have the blessed opportunity to preach this weekend at my church. The pastor asked me and I was both humbled and honored. But most importantly, I feel slightly nervous with the task of preaching God’s Word to God’s people. The irony is that I push the importance of children’s ministry so much, but don’t feel this “holy reverence” to the task of teaching God’s Word when I’m in the children’s worship room. Maybe it’s familiarity, maybe it’s mediocrity. Maybe it’s me relying on my own strength. Whatever it is, may the Lord challenge me with this opportunity to ALWAYS (no matter the age group) see every teaching/preaching moment with a holy fear. They said that Martin Luther’s knees would knock beneath the pulpits from which he preached. Now for the Shema – that is the text of my sermon. My main point will be that God’s first command to Israel AFTER the Shema is the “greatest commandment” (Love the Lord your God with all your heart, mind, and strength). And then, the first thing Israel needs to do with that command is teach it to their children. Passing on the legacy of faith to children is something so key yet so forgotten these days. Marva Dawn said that she once had a hard time finding an honest roofer – a worker with integrity. Where do people gain or lose their standards of integrity? Not in trade school. It was when they were lying down and waking up and walking along the road with their parents as a little child. Parents should be the primary spiritual leaders to their kids – not the church children’s/youth pastors. Please pray for me this coming Sunday. His Word. His Church. His grace. 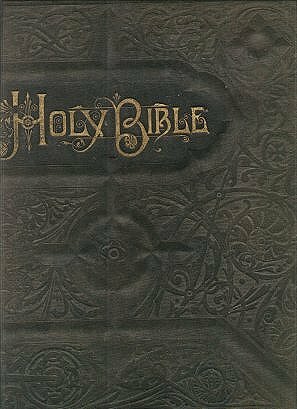 There must be a greater reason than just literary structure and clarity as to why more copies of the Bible have been purchased and published around the world in plenty of languages. I must quote a book I have been reading for class recently. 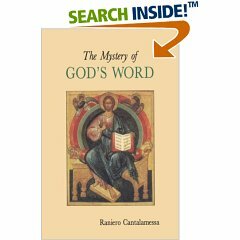 It is called The Mystery of God’s Word by Raniero Cantalamessa. The title doesn’t sound too enthralling at first glance. And the author is far from your typical American Evangelical. This guy, Raniero, has been the Pastor to the Papal Household since 1980. That’s right, he’s the Pope’s Pastor. “In the world at large and even within the Church there have been and there will be better books than some books in the Bible – of greater literary refinement and, religiously speaking, more edifying (suffice it to mention The Imitation of Christ) – yet none of these produces the effect that the most modest of the inspired books produces…In Tales of a Russian Pilgrim, we read of many people being cured of the vice of drinking, thanks to their having kept a resoluton to read a chapter of the gospel whenever they felt the compulsive need for a drink coming on. Recommending the practice to one such, a monk said, ‘In the very words of the Gospel there is life-giving power, for in them is written what God himself has uttered. Never mind if you do not understand it properly; it is enough if you read carefully. If you don’t understand the Word of God, the demons certainly do understand what you are reading, and they tremble. '” (Reniero Cantalamessa, The Mystery of God’s Word [Collegeville, MN: The Liturgical Press, 1994], pp. 13-14).